Starving people do not need vaccines. They need food. It seems like it would be common sense to acknowledge something so basic, yet the big money and “brightest minds” refuse to acknowledge such a basic concept. Hygiene, sanitation, and nutrition are not profitable like drugs and vaccines. Much of the ruling class on planet earth operates under the false tenants of Pasteur’s Germ Theory. The people who will survive operate in alignment with Bechamp’s Law of the Terrain. The former is a fear-based paradigm and the latter is a way of life based upon your full creative ability to meet and overcome all of life’s challenges. Which way do you live your life? Follow-up listener email from Kirk: “I called the folks at King Bio. Great people. Thanks for the tip! One more question, I am a supplement junky, taking milk thistle, multivitamin, niacin, vitamin c, glucosamine, saw palmetto and what ever else is the flavor of the week. I have always just taken things on a whim. Is there a vitamin/supplement regimen you recommend? Not for nothing but the teen-ager at the vitamin store is not exactly an authority in my view. My goal is just to be healthy. 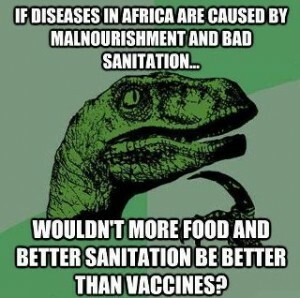 Very well said, Starving people do not need vaccines.